This article is about the 2015 Broadway cast recording. For the musical, see Hamilton (musical). For the 2016 mixtape inspired by the show, see The Hamilton Mixtape. Hamilton is the cast album to the 2015 musical Hamilton. The musical is based on the 2004 biography of Alexander Hamilton written by Ron Chernow, with music, lyrics, and book by Lin-Manuel Miranda. 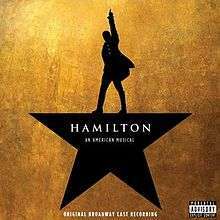 The recording stars Lin-Manuel Miranda, Leslie Odom Jr., Phillipa Soo, Renée Elise Goldsberry, Christopher Jackson, Daveed Diggs, Anthony Ramos, Okieriete Onaodowan, Jasmine Cephas Jones, and Jonathan Groff. It also features Jon Rua, Thayne Jasperson, Sydney James Harcourt, Ariana DeBose, and Sasha Hutchings. It achieved the largest first week sales for a digital cast album and is the highest-charting cast album since 1963. It was the highest-selling Broadway cast album of 2015 and peaked at number one on the Rap Album chart, the first cast album to ever do so. The cast album for the musical premiered in September 2015 on NPR's website." Its digital release on September 25, 2015 debuted on numerous charts and was released in stores as a two-disc set on October 16, 2015. It debuted at number one on the Top Broadway Albums chart as well as number 3 on Top Rap Albums, number 5 on the Top Digital Albums, and number 9 on the Top Current Albums chart. Hamilton's debut was the second biggest first week sales of a Broadway cast album, just behind the cast album for the musical Rent. It debuted at number 12 on the overall Billboard 200 chart for sales, with over 2.1 million streams combined from digital service providers, the largest streaming debut for a cast album ever. Following the 2016 Tony Awards, the album re-peaked at number 3 on the Billboard 200 chart, making it one of only three cast recordings to reach the top 10 in the last 50 years. The album was the highest-selling Broadway cast album of 2015 and peaked at number one on the Rap Album chart, the first cast album to ever do so. It achieved the largest first week sales for a digital cast album and was the highest-charting cast album debut since 1963. Billboard called the album an "eye-popping debut," giving it a 5-out-of-5 star review and listing it at number 2 on the magazine's "50 Best Albums of 2015." Rolling Stone gave it a 4.5-out-of-5 star rating, listing it at number 8 on the magazine's "Top 50 Albums of 2015." Robert Christgau wrote in Vice, "I can attest that the intrinsic intellectual interest [Lin-Manuel Miranda] powers up here is so impressive it's exciting." 4. "The Story of Tonight"
12. "The Story of Tonight (Reprise)"
17. "That Would Be Enough"
19. "History Has Its Eyes On You"
4. "Say No to This"
5. "The Room Where It Happens"
8. "Washington On Your Side"
16. "Blow Us All Away"
19. "The Election of 1800"
21. "Best of Wives and Best of Women"
22. "The World Was Wide Enough"
↑ Donelson, Marcy. "Hamilton: An American Musical [Original Broadway Cast Recording] – Lin-Manuel Miranda". AllMusic. Rovi Corporation. Retrieved 25 June 2016. 1 2 Gale, Alex (1 October 2015). "Hamilton, the Best Broadway Musical in Years, Boasts an Equally Thrilling Cast Recording: Album Review". Billboard. Retrieved 20 January 2016. 1 2 Spanos, Brittany (25 September 2015). "Hamilton: Original Broadway Cast Recording". Rolling Stone. Retrieved 20 January 2016. 1 2 Christgau, Robert (February 19, 2016). "Poets, Playwrights, and Pranksters: Expert Witness with Robert Christgau". Vice. Retrieved February 22, 2016. 1 2 3 4 Caulfield, Keith (7 October 2015). "Hamilton's Historic Chart Debut: By The Numbers". Billboard Magazine. Retrieved 20 January 2016. 1 2 Estevez, Marjua (18 November 2015). "Hamilton Broadway Album Tops Billboard Rap Chart". Vibe. Retrieved 20 January 2016. ↑ Jekket, Frannie (21 September 2015). "Review: Cast Recording, 'Hamilton'". NPR Music. Retrieved 20 January 2016. ↑ "'Hamilton' Cast Album Races to No. 3 on Billboard 200 Chart After Tony Awards". Billboard (magazine). 19 June 2016. Retrieved 19 June 2016. ↑ "Rolling Stone's Top 50 Albums of 2015". Brooklyn Vegan. 1 December 2015. Retrieved 20 January 2016. ↑ Miranda, Lin Manuel. "COMPLETISTS ONLY (Spoilers)". Lin Manuel Miranda's Official Tumblr. Retrieved 19 June 2016. ↑ "ARIA Australian Top 50 Albums". Australian Recording Industry Association. June 20, 2016. Retrieved June 18, 2016. ↑ "Ultratop.be – Musical – Hamilton - Original Broadway Cast Recording" (in Dutch). Hung Medien. Retrieved June 18, 2016. ↑ "GFK Chart-Track Albums: Week 24, 2016". Chart-Track. IRMA. Retrieved June 17, 2016. ↑ "NZ Heatseekers Albums Chart". Recorded Music NZ. June 20, 2016. Retrieved June 17, 2016. ↑ "Official Albums Chart Top 100". Official Charts Company. Retrieved June 18, 2016. ↑ "Nick Jonas Debuts at No. 2 on Billboard 200 Albums Chart, Drake's 'Views' Steady at No. 1". Billboard. Retrieved June 20, 2016. ↑ "Original Broadway Cast – Chart history" Billboard Top Rap Albums for Original Broadway Cast. Retrieved June 20, 2016. ↑ Ward, Marguerite (22 December 2015). "Hamilton Fan Art: Animation Student Beautifully Recreates Scenes from Lin-Manuel Miranda's Broadway Smash Hit". International Business Times. Retrieved 20 January 2016. ↑ "Creed Tops 47th Annual NAACP Image Award Nominations". Ebony. 5 February 2016. Retrieved 20 January 2016.